Let’s take a trip back to the early 1st century. It’s a few days before Passover and the Jews are heading to Jerusalem for the Feast. As they travel, they sing the songs of ascent like they do every year. On this particular year, though, there’s an extra level of excitement. A man named Yeshua (Jesus) arrived on the scene a few years ago and many think he could be the Messiah. He’s even riding into Jerusalem on a donkey’s colt, as Zechariah said the Messiah would. “Hoshiya-na! Baruch haba B’Shem Adonai!” they call. Save us now! Blessed is He who comes in the name of the Lord! As Yeshua rides in, the people spread their garments in the way. They also cut palm branches as if they were here for the Feast of Tabernacles instead of the Passover and the Feast of Unleavened Bread. They’re expecting the Messiah to kick the Romans out, redeem Israel, and restore the kingdom. They’re hoping for the fulfillment of Tabernacles — the Messiah, son of David, ruling in power and might. How many times can God forgive you? I think sometimes we might feel there’s a limit, or that God gets tired of “dealing with” us. We might even think that someday He could just give up on us if we can’t get ourselves straightened out fast enough. But what does the Bible say? This doesn’t mean God winks at sin or thinks it’s not a big deal. “The compensation due sin is death,” and without His mercies we would be finished (Rom. 6:23, LEB). But the mercies don’t run out. Each morning we have a chance to walk with Him, repenting of past wrongs, letting Him work in our lives to make us like Him, and trusting in his loving kindness, compassion, and faithfulness to lead us into a hopeful future. Who responded to Jesus best when He walked on this earth? It wasn’t the religious leaders or the pious folk or the wealthy and powerful. It was the ordinary people, the sinners and the outcasts of society. But why is that? The Christian message carries good news for all people. What made some receive it joyfully and others want to kill Jesus? There’s a story in Luke 7 that might shed some light on this. One of the Pharisees, a man named Simon, invited Jesus over for dinner. A woman known in her city as “a sinner” followed them and started crying on Jesus’ feet. She washed His feet with her tears, wiped them with her hair, kissed them, and anointed them with oil. Jesus went on to list the ways this woman demonstrated her love for him (which, incidentally, highlighted Simon’s deficiencies in hospitality). 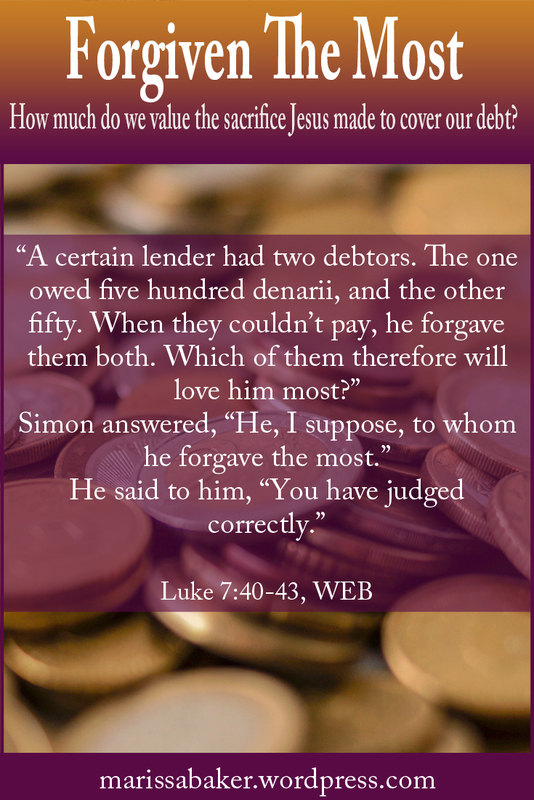 He finished His conversation with Simon by saying, “Her sins, which are many, are forgiven; for she loved much: but to whom little is forgiven, the same loveth little” (Luke 7:47, KJV). How Do I Repent and Change? Repentance from dead works is the first of the foundational truths listed in Hebrews 6. 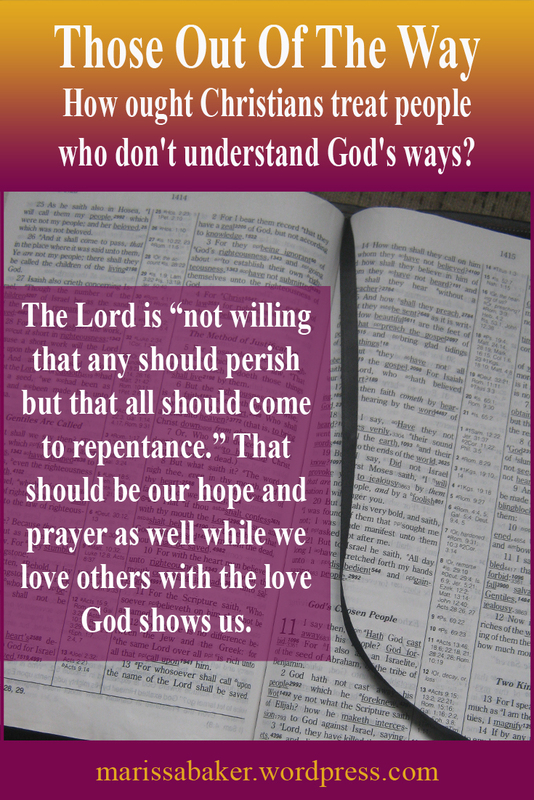 But how well do we really understand it and how many of us truly practice repentance? When I was baptized, the minister asked if I’d repented of my sins and accepted Jesus Christ as my personal savior. 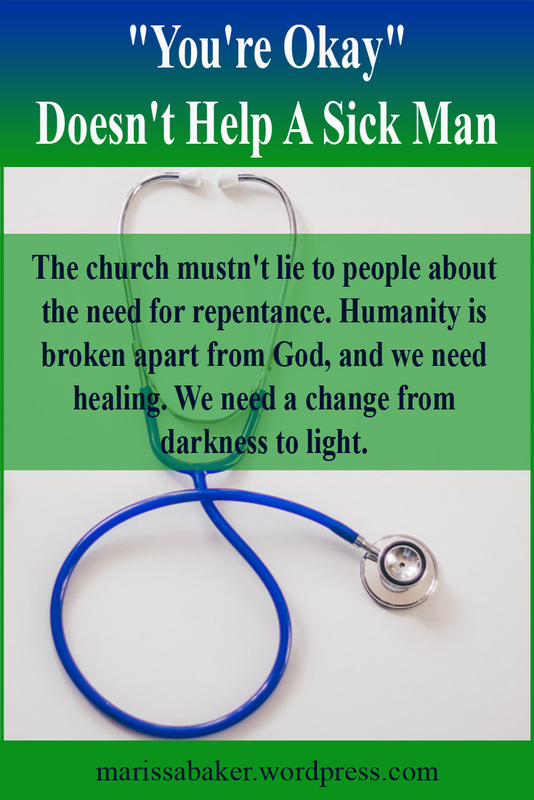 I meant it when I said yes, but I’m not sure I really understood how much more repentance is than just an, “I’m sorry I messed up.” It involves a change in our innermost being that manifests in a commitment to turn away from things displeasing to God. 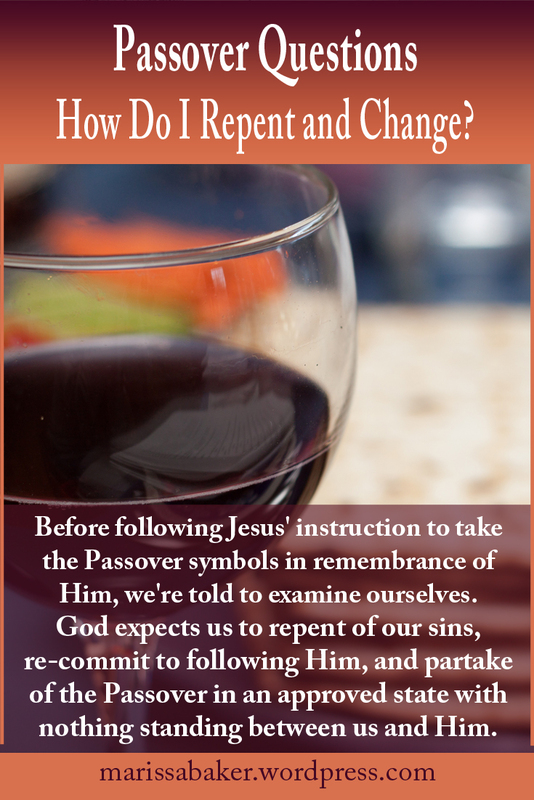 As we prepare for Passover, we ask God for feedback on how we’re doing in our walk with Him. We examine ourselves to see if there are hidden sins in our lives and ponder how we can become better examples of our Lord Jesus. But we can’t stop there. We have to act on what we learn. Imagine you’ve noticed something wrong and you go to the doctor. They run their tests and scans, take their samples, and sit you down with the results. You were right — you’re sick and quite probably dying without prompt attention. But instead of offering a cure, the doctor says he can alter the test results. You’ll still be dying, but you can pretend you’re not and tell all your friends the doctor says you’re fine. Sounds ridiculous, right? I’m not sure any of us would take that deal. But that’s what churches are doing on a spiritual level if they hold out the idea of salvation without repentance. Our Western society is uncomfortable with objective morality. It’s unpopular to think certain actions are inherently wrong. We don’t want to acknowledge a higher power with the right to determine what is and is not sin. Yet that’s exactly what you must do when you become a Christian. My decision to follow Jesus means I’m not the ultimate authority in my life. He and Our Father are. How ought Christians treat people who don’t understand God’s ways? There’s a very real temptation to belittle and criticize others for not believing the same things we do. Yet that’s not the sort of spirit God looks for in those who follow Him. While keeping the Feast of Tabernacles (Sukkot) this year, one of the speakers shared a story from his time at a Bible college (click here for sermon recording). He and his classmates were assigned to read Emily Dickinson and analyze her theology. They picked it to bits, critiquing every way she didn’t understand their church’s teachings on the purpose and future of mankind. When they presented it to their teacher, they expected high marks. Instead, the teacher grew angry. “You’re belittling the miracle of your calling,” he said. When we as Christians expect those who’ve not been called into God’s truth to understand, we aren’t acknowledging the miracle God performed when He enlightened us. When we condemn those who are earnestly seeking God and don’t have all the pieces, we condemn ourselves for a lack of compassion (and for arrogance in thinking we have all the right answers). We become like those Jesus criticized “who trusted in themselves that they were righteous, and despised others” (Luke 18:9-14).